Got out around 4 and soon it was dark, but saw this awesome Sunset today and I thought I'd share it. Enjoy! WOW John!!! the color in this is absolutely delightful!!! Great job! Stunning...You often see beautiful sunsets but every now and again one will take your breath away as this one does. I think what does it for me is the lake with the reflection of the sunset and the birds. Very nice John, glorious colours. Thanx and I really didn't want to shoot landscapes, as I only had my 100mm macro lens with me, so this one was shot with my macro lens. AT one point the birds got scared from something and took off, unfortunately I wasn't at the shore, but it was beautiful. 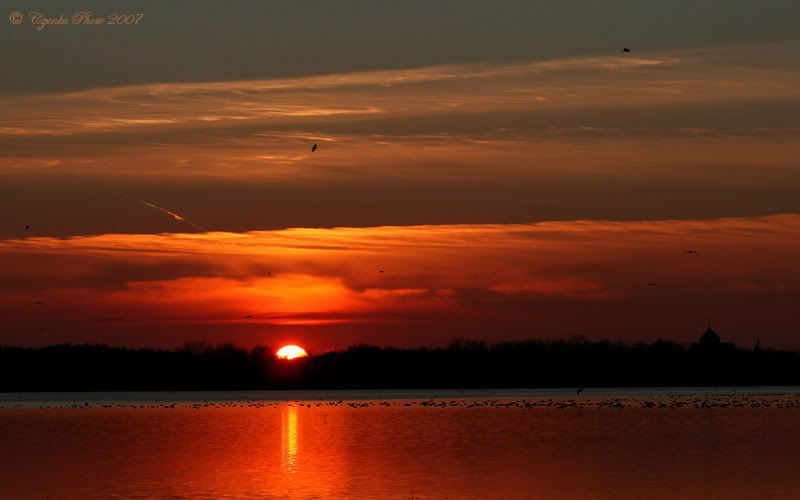 Thousands of birds take off at once, in front of this sunset. oh I like this a lot! we've been getting some amazing sunsets lately! Thank you again, Hipster, I see one on your avatar, very nice! John this really is a sight to behold! We have had some bright sunsets but not a cloud in the sky, not worth taking, the clouds and the reflections here are wonderful. I'm not terribly surprised though, all your work is super.